West Coast Oddball Knitters are now working on Purple Mountains Majesty. 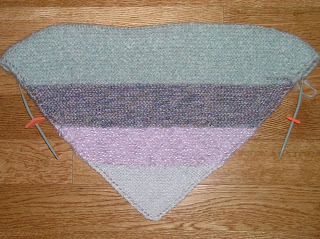 This beauty is going to be knit with different shades of purple. 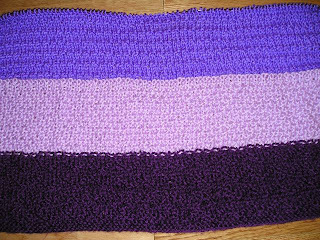 I used Simply Soft Grape in my section and tried the Andalusian Stitch. 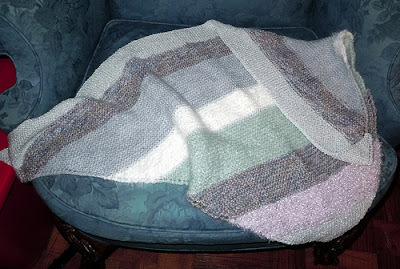 This was a new stitch for me: it knits up quickly and adds texture to the blanket. It is finished and ready to be given to a hospital. In May, I made the decision to upgrade the windows in my house (circa 1980) from single panes to insulated, double-paned. One of the women in my knitting circle lives in my neighborhood, and her house is the same age as mine. 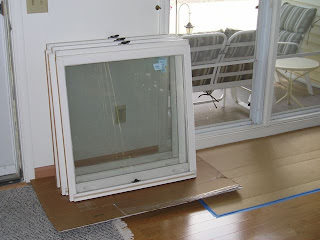 Last year, she and her husband replaced the single-paned window sashes for double-paned sashes. With her recommendation, I made the plunge. So, on Wednesday, it was out with the old, and in with the new. The windows were installed with minimal mess. The two-man crew was in and out of my house in two hours and most of that time was removing and reinstalling a window air-conditioner in one of the frames. 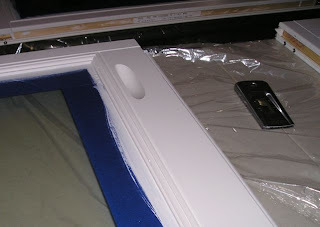 The new sashes are aluminum coated on the exterior, so only the interior frames needed painting. Of course, that meant taping around the edge (I am a messy, messy painter), priming and then painting. I like the new sashes, but they are HEAVY, almost too heavy for me to heft around. I cannot remove the new sashes from the kitchen window because they are horizontal sliding and over the sink. I cannot get close enough to get good leverage. I am hoping my nephew will be here this week to help me remove it for painting. 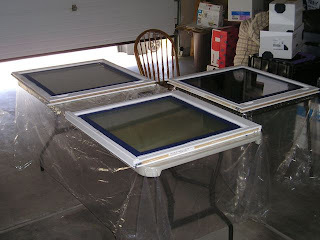 I have three windows left to prime and paint, so I will be watching paint dry for another couple of days. These items have been completed for some time, and it is time to get them sent. So, the items are packaged and ready for the mail. 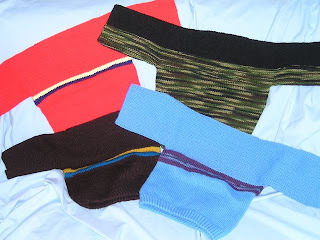 These four Guideposts Sweaters will warm a child somewhere in the world. 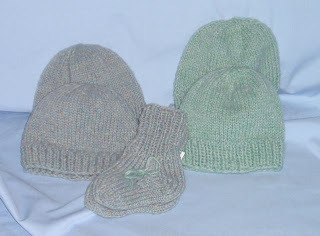 They are extremely easy to knit, and I adapted the pattern to eliminate seaming. Another package of wool baby hats and socks will be sent to the All Crafts for Charity coordinator for the Rankin Birthing Centre in Canada. They are knit from wool reclaimed from thrift shop sweaters. Just like many other knitters, I have been spending my time in front of the TV marveling at the accomplishments of the athletes from around the world and making good use of my time by knitting. Of course, I do some mindless knitting because I get too caught up in the events to concentrate on a pattern. I rescued some small balls of yarn from my scrap bag and knit some garter stitch 12 inch squares. I'll send them to a woman who joins them to make lap robes for nursing homes. It always amazes me how the squares turn out. 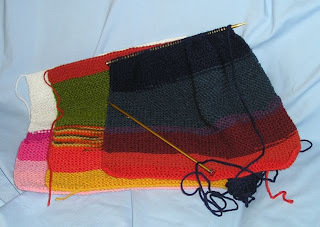 I am partial to the one I have on the needles right now, as the rich colors look good together. 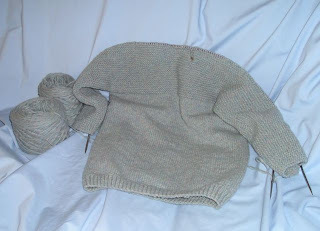 I am nearly finished with a wool sweater for the afghans for Afghans Youth Campaign. 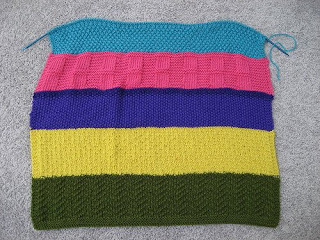 For some reason the garter stitch on the sleeve portion seems to take forever to see any progress, compared to the garter stitch squares that take no time at all. At any rate, by the time the Olympics is over, I should have a finished sweater, a pile of 12 inch squares, and a lighter scrap yarn bag. When I was a teenager, I helped my mother can fruits and vegetables. I dreaded it at the time, but now I am thankful for the experience and the confidence that it gave me. I am now able to make my own jellies, jams, pickles, etc. if I desire. It is gratifying to see the end result and to savor the taste of summer in the middle of winter. Today, I captured some summer sunshine in mason jars. I think my mother would be proud. My neighbor gave me a bag of apricots from her tree since the branches were so burdened with the fruit and bending to the ground. 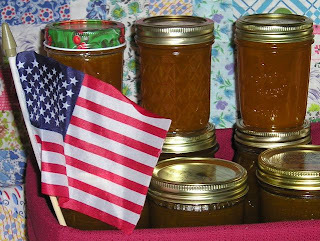 Working with apricots was new to me, so I searched the internet for an apricot jam recipe. Apricots are a low pectin fruit and require additional pectin. 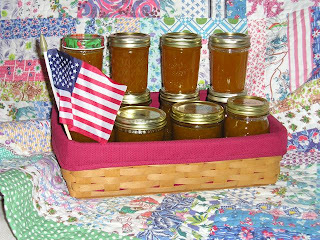 I have used MCP pectin many times and trust their recipes to be easy and tasty which is why I selected the MCP apricot jam recipe on Kraft foods website. I was surprised how easy this jam was to make. I used my mini food processor to chop the fruit, and I probably pureed it too much, but the consistency was difficult to judge. Two batches of the recipe resulted in 10 pints of jam. My mother's birthday is today, so in her honor, I photographed the jam on a Rail Fence quilt that I made our of some flour sacks that I inherited from her. Mom was always baking and canning on the farm. She had a lot of people to feed during harvest. I remember helping her select flour sacks that matched those that she already had so she would have enough fabric to use for pillow cases, dish towels, and sometimes clothing. The fabric is typical of the fifties and early sixties - gawdy and bright. i wanted to share this last set of quilt photos before I forgot. 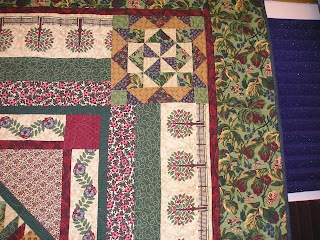 Several quilts were displayed using this pattern because the guild ladies made them in a class. 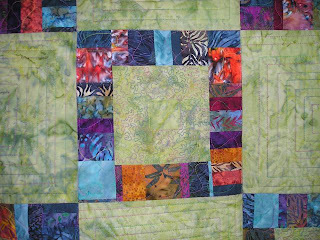 I was drawn to this Green Sampler because I like more traditional quilts, but the quilt was also made in "brights" in purples, in navy, and in batiks. 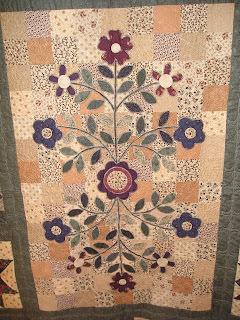 The center of the quilt was appliqued. The stitches on this one were too even to have been hand-appliqued, so I think it was done on a machine. I named this quilt, Framed Squares, and it looks like a really great stash buster. I first thought that the frames were made of simple fabric strips, but the frames were made from strips made from large and small scraps. This one is so simple that it could be made in a single weekend. The label said this quilt was made for a wedding gift. This quilt would certainly be at home in a cabin. I can almost feel hear logs popping in the fireplace. 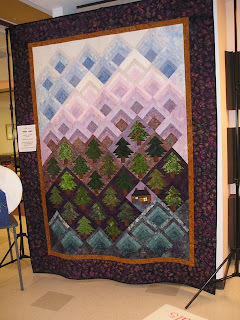 The Dubois Quilt Show/Festival is over for another year. 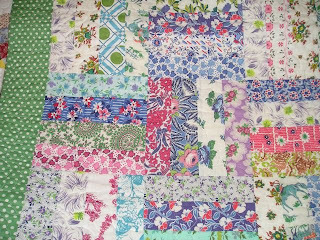 As usual, the quilts were beautiful and gave me some ideas for using my scraps. When I ravel a sweater to reclaim the wool, I wonder if it is worth the time that it requires, but when the wool is washed and twisted into hanks, I always admire the colorful bundles. 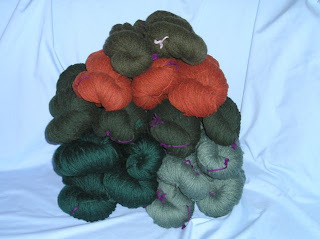 The latest batch of yarn in Fall colors came from five sweaters (all 100% wool or 100% Lambswool) that I purchased in February when I was in Denver, CO. I still have three mounds of sweaters stored in Space Bags in my garage that need to be raveled. If I continue to work on them in small lots, I may begin to see definite progress before Winter sets in. 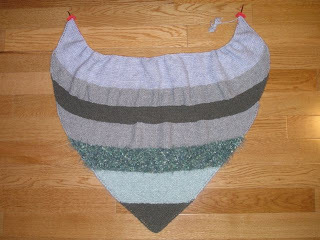 Angel Wings, an Oddball Shawl (top right), landed briefly in Wyoming this week. 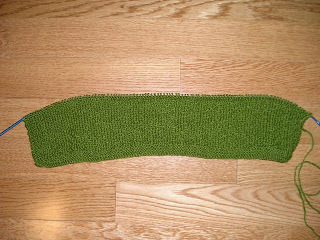 I used the mohair I found at a thrift shop earlier this summer to knit my section. 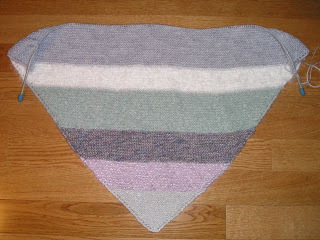 Between the Angel Wings and Rainy Days (bottom right) shawls I have used one and a half balls of the mohair. I have five more skeins and will use it again when the shawls return to me for another round of knitting. Angel Wings arrived in my mailbox on Thursday so I could add another section. This time I used a pale gray yarn that I found in my stash. I think the yarn has a bit of mohair in it as it has the typical halo and is very soft. Rainy Days returned to Wyoming on November 3, 2008. 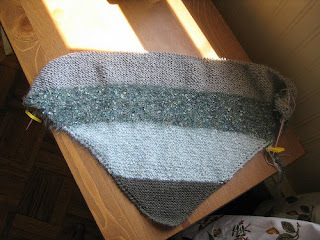 This time I used a pale gray mohair yarn from my stash. This shawl is very, very soft. Rainy Days is nearly finished. 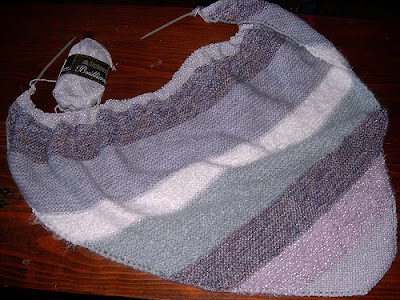 I can't believe it took this long for someone to finish knitting these shawls. One of the main reasons that I left this group was how slow the shawls were moving. 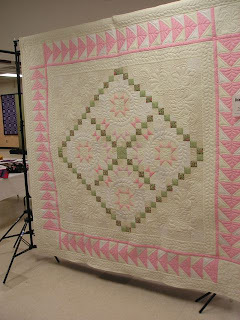 More quilt photos from the Dubois show. 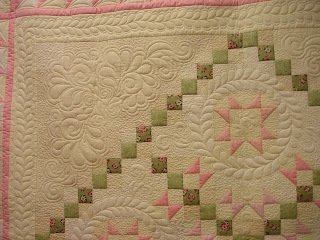 This quilt reminds me of a wedding cake. It was so delicate and yet filled with intricate detail. The amount of quilting is breath-taking. 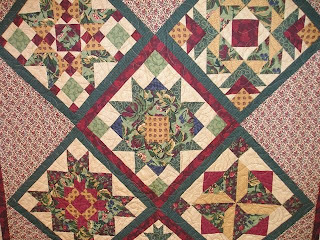 This small quilt, probably a crib-size appeared to be a printed panel, but when inspected closer, the detail reveals that it was appliqued and even embellished with embroidery and buttons, making a fun and lively quilt. 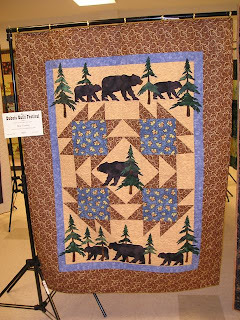 The label and fat quarter pinned at the bottom revealed this quilt had been entered in the Fremont County Fair last week. i did not see it there: it must have been one of those displayed high off of the ground and overlooked by spectators. A real shame because this one is a stunner. This morning, I achieved one of my goals for the month: my scrap fabric piles have been tamed. 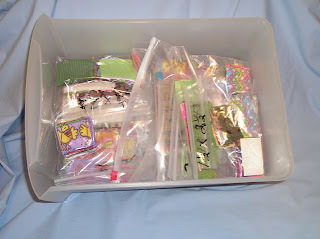 It always amazes me how much less space the scraps take to store when they are cut and organized. I used Bonnie Hunter's techniques for taming my scrap fabric. 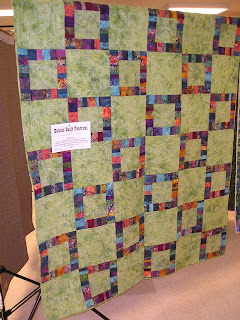 Bonnie has tutorials for using even the smallest scraps to make Crumb Quilts and String Quilts. 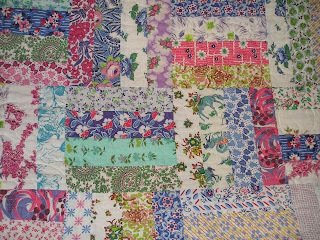 I don't know what kind of a quilt I will make from my scraps, but at least the fabric is cut and organized and is ready when I get inspired. Cutting fabric accurately takes me a lot of time, and I despise it; thus, I delay it as long as I can. Now that I my scraps have been tamed and are housed in one drawer, I think I can stay motivated to cut any future scraps as soon as I finish a project. I do not plan of saving the tiniest bits of fabric that do not fit into the standard sizes categories because I know that I will never use them. 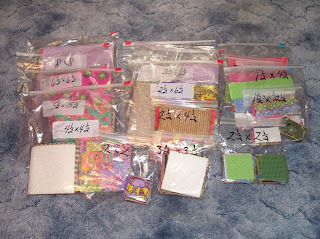 My goal was to organize my work space and to keep useful fabric. This chore can finally be checked off of my "To Do" list. 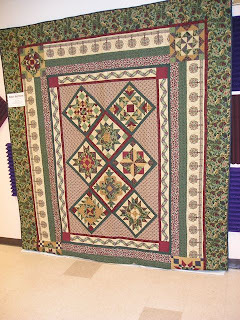 Yesterday a friend and I drove to Dubois for a Quilt Show, unfortunately, we were a day early. Without fail, I attend this show every year and look forward to driving the 64 miles to the "High Country." This year I relied on a local quilt shop newsletter that listed the show dates on its event calendar. Yesterday was set-up day for the show. The ladies at the door were accepting the display quilts and moving quilts and items around in preparation for the Friday opening. Graciously, they allow us to have a "private showing" as they worked and rearranged the quilts. I was thankful that our outing was not spoiled. As usual, the number of quilts on display was impressive for such a small town (population 962) and the guild does a wonderful job displaying the quilts. A few caught my eye and attention more than others. The photo above is this year's raffle quilt. The guild makes a quilt every year and sells chances and gives the proceeds to a local charity: day care centers, fire department, senior center, Meals on Wheels, etc. This year's charity was a local day care center. One of the ladies setting up the show told me since they began sponsoring a charity raffle quilt, they have raised over $33,000 for their community. What a wonderful gift these quilters are giving to their community. See how the fabrics coordinate and work so well together. The center also packs a punch. It was a lovely quilt. 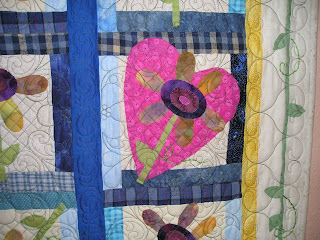 More quilt photos to be posted later. 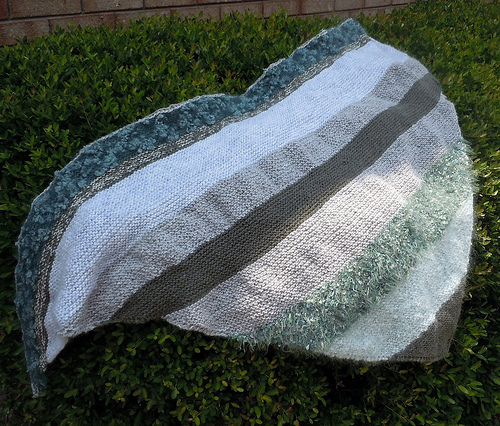 I had the opportunity to start a new Oddball blanket for West Coast Oddball Knitters. AuburnChick, the group coordinator, sent me a circular needle, and I found a moss green yarn in my stash. I used a Single Chevron stitch on this section of the blanket, but unfortunately, the yarn did not allow the stitch to photograph well. I am hoping that as others knit on this blanket, they will be able to capture the texture in their photographs. Rain Forest is finished and ready to be given to a hospital nursery. West Coast Oddball blankets are on the move. 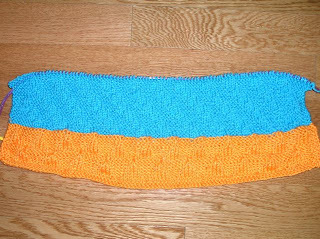 I finished my section of Grand Canyon Sunset yesterday by using a Garter Stitch Steps stitch. 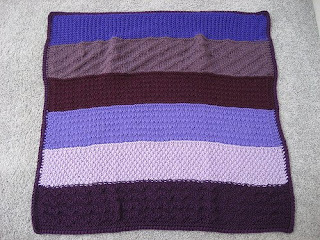 The stitch worked up quickly and added some texture to the blanket. 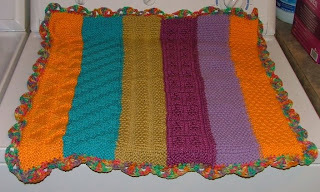 I was going to use a muted tone of the Mango yarn that AuburnChick used to start the blanket, but it just didn't look right. I opted for a turquoise from my stash which is brighter than I would like, but it was the best I could find without going out and purchasing a new yarn which, in my opinion, defeats the purpose of the Oddball knitting. 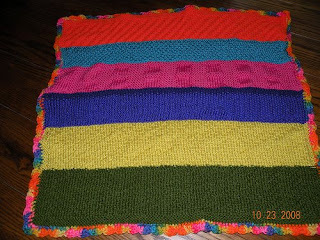 I knit strictly from my stash for these blankets. Fremont County held its fair last week, and as usual, the temperatures soared into the high 90's and pushed 100. When I was growing up and in 4-H, I entered items in the fair every year, but as I aged, that desire faded and, sadly, so has the fair. My knitting group urged all the members to enter items made with natural fibers to draw interest to the local wool industry. 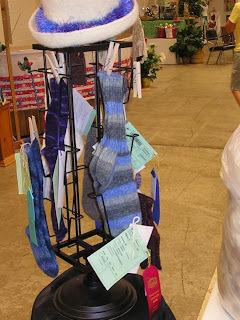 I didn't have much to enter because I give my knitting away, but I did have a pair of basic socks that I had kept and hadn't worn. I also quickly knit a baby hat from some reclaimed wool. I added the required hanging sleeve to the back of the quilts I recently finished. 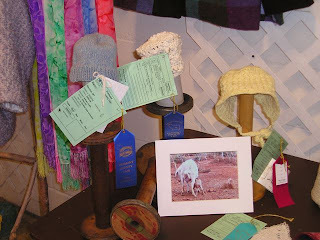 Thus, I entered four items in the fair: Duluth Stars, Scrappy Spools, a wool baby hat, and a pair of wool socks. I was bitterly disappointed in how all the quilts were hung this year. 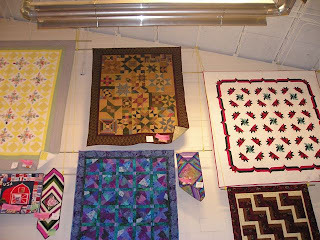 Normally, the quilts are suspended and showcased in the middle of the large armory building, so the fronts and backs are visible. This year, the entries were hung along the sides of the building. 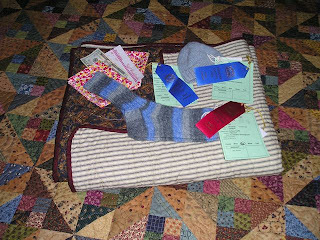 Fair officials were concerned that the number of entries were down, so they hustled and found some quilts to hang for "Display Only." 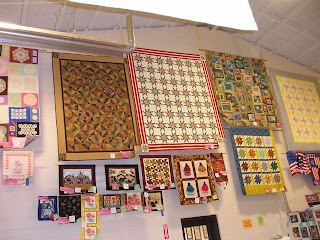 These "Display Only" quilts and wall-hangings were the ones showcased in the center of the building. You can see how high the entry quilts were hung, too high to appreciate the quilting and impossible to see the backs or even the names of who made them. My quilt is the first quilt on the left, above the black-framed wall hangings. Note that some odd reason, the name tags of the quilts on this wall are covered by the folded-back corners of the quilts. Of course, at the height the quilts were suspended, it would have taken binoculars to see the tags if they hadn't been covered. 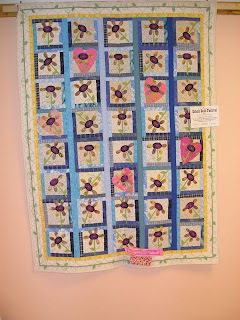 My other quilt was displayed in the same manner. Even the table runners that are hung below these quilts are too high to appreciate the work that went into them. I voiced my disappointment to the Quilt Superintendent and to the Assistant Fair Manager, but I think my complaints fell on deaf ears. 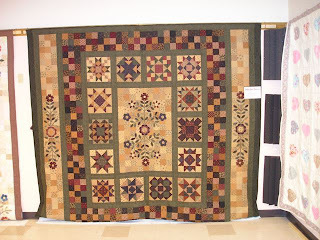 I hope that others complained, so the quilt entries next year will once more be showcased in the center of the building. I doubt that I will enter any quilts next year, but who knows, I may get another one finished. It wasn't until I got my items home that I discovered a blue ribbon pinned to the Duluth Stars quilt. The ribbon was on the name tag, and thus, under the folded-back flap on the quilt top. It was a winner, and I didn't even know it. I earned $29 in award premiums, two fat quarters, and a $5 gift certificate for fabric at the local Ben Franklin Crafts store for my meager entries.